X-cart is open source eCommerce platform for high-performing online stores. Experts describe x-Cart as a global eCommerce software pioneer, on the market for more than 16 years. More than 35,000 online stores in 111 countries around the world effectively use this platform. X-cart is easy to maintain and easy to use, you just need to choose a design template it offers and start customizing your online store. X-cart has many modules to make your store more efficient. One of them is SendPulse integration. It allows you collecting emails of your subscribers and send automated email campaigns with product recommendations. All your new subscribers will be collected in your SendPulse email list. In future, you can send them automated email campaigns with advanced reporting features, segmentation of the customer database, integration with Google Analytics. You can choose email list to which your x-Cart store registered customers will be exported and send them effective product recommendations and other emails. 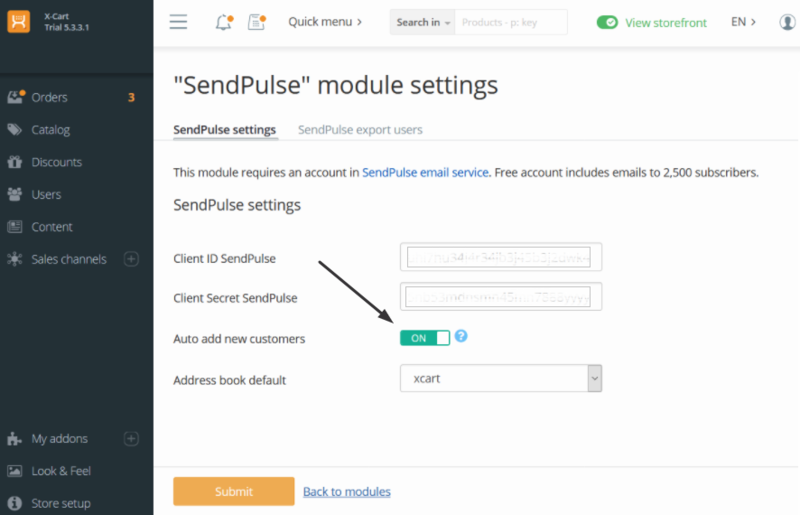 You need to enable your SendPulse integration module in your store marketplace. After the installation is complete, go to the setting section and fill in all the necessary fields here: "Client ID SendPulse" and "Client Secret SendPulse". All these data you will find in your SendPulse "Account settings" in the "API" tab. Click "install" right next to the module. SendPulse allows you sending up to 15,000 emails to 2,500 subscribers per month for free. It’s a significant amount for small businesses. Try SendPulse integration for your x-Cart store and boost your sales! Read more about SendPulse integration on x-Cart website. The user with such email-address already exists. You can Login or Restore a password. Such phone number is already registered.You can Login or Restore a password. Looks like you already have an account. Please email us at support@sendpulse.com if you think this is en error. The user with such email-address already exists. A user with email already exists. Click the "Recover password" button to restore your password or click here to Login. USER_WITH_PHONE_EXIST Click the "Recover password" button to restore your password or click here to Login.